DUBLIN, IRELAND--(Marketwired - April 06, 2016) - Research and Markets has announced the addition of the "Growth Opportunities for Titanium in Global Aerospace Industry 2015-2020: Trends, Forecast and Opportunity Analysis" report to their offering. 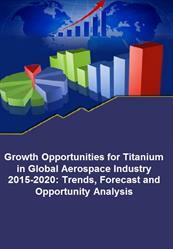 This comprehensive report predicts that titanium in the global aerospace industry is to grow at a CAGR of 3.3% during the 2015-2020 period. Market size estimates: Titanium in global aerospace industry size estimation in terms of volume (M lbs.) and value ($M) shipment. Trend and forecast analysis: Titanium in global aerospace industry trend (2009-2014) and forecast (2015-2020) by region and segment. Segmentation analysis: Titanium in global aerospace industry size by application and aircraft types such as commercial aircraft, general aviation, helicopter, regional jet and military aircraft both in terms of volume and value shipment. Regional analysis: Titanium in global aerospace industry breakdown by key regions such as North America, Europe, Asia Pacific, and Rest of World. Strategic analysis: This includes M&A, new product development, competitive landscape, and expansion strategies of titanium products suppliers in global aerospace industry. Emerging applications: Emerging applications of titanium in global aerospace industry in various markets. Baoji Titanium Industry Co. Ltd.